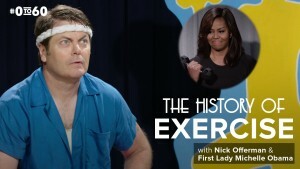 The video, now live on Funny or Die – various fitness trends from decades past, with a little help from First Lady Michelle Obama and actress Megan Mullally. While fitness has come a long way from electrical muscle stimulators and shake weights, some things will never change, like the importance of adopting a healthy lifestyle and having fun while doing it! Working on projects for mission-based clients has always been at the core of who SS+K is and #0to60 is no different. It was truly a labor of love from so many people across our agency and we’re proud to be a part of it. Comedian and actress Megan Mullally, who happens to be Offerman’s wife, using muscle shockers to firm up her husband’s abs. Offerman gettin’ “Physical” in pink spandex. The “shake weight,” otherwise known as the greatest health contraption ever devised in the last century. Start your journey from #0to60 here. ← BFF Trump in Your Face!